I grew up in Manhasset, New York and received an economics degree from Haverford College. I’ve been an athlete my entire life and played lacrosse through college. At Haverford I was a 2-year captain of the team and helped lead us to our first ever Conference Championship in 2010. We also made a run to the quarter finals of the NCAA tournament that year, the furthest we’ve gone in history. Since college, although I don’t get to play lacrosse as much as I’d like, I keep busy playing golf, running and working out regularly. Its nice to set physical and athletic goals to work towards such as Marathons, Wall Street Decathlons, and Tough Mudders; in addition to other events and races that come up in my post collegiate years. More often than not I’m running or competing for Team Boomer and the foundation. Professionally, I’ve worked for Cantor Fitzgerald in New York City since I graduated. I spent 3.5 years working in an analyst position directly for the Chairman and CEO of the company, then a year as a credit analyst on the High Yield Bond desk before moving into Sales. Gunnar and I have been best friends since we moved in across the street from each other in 1993. Our families remain close and my parents were involved in the foundation from day one. I followed in their path, wanting to help with a cause that has always been so close to home. I’ve volunteered for the foundation since High School and soon after graduating from Haverford, I was invited to join the Young Professionals Committee. So from the beginning, I’ve not only been involved with Team Boomer, but the foundation itself as well. 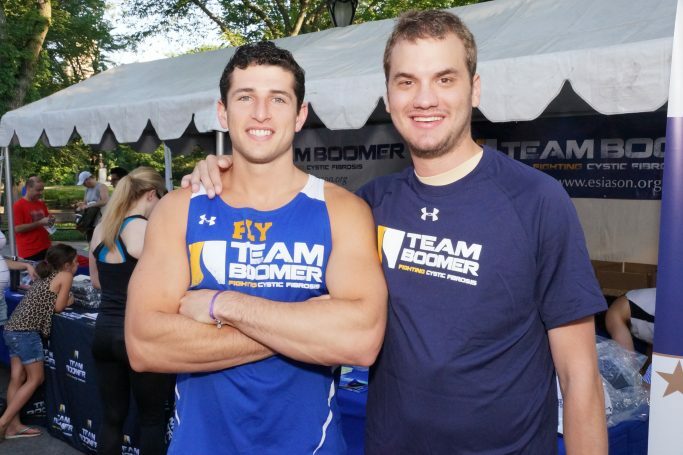 I’ve participated in a lot of Team Boomer events over the years and the NYC Marathon has been my best memory by far. In fact, it is one of my all-time best experiences, period. I’ve run it twice and I strongly encourage anyone who is considering… to go for it! I promise you won’t be disappointed. You don’t understand the feeling of accomplishment until you actually do it. You don’t have to break any records, just give it a shot. Run for a cause, raise money, spread awareness, train hard, stay focused, and enjoy the experience on game day. There is no other feeling like running over the empty 59th street bridge, half way through the race, and then pouring out onto 1st avenue to the roar of fans cheering you on by name. And there is no other feeling like crossing the finish line in Central Park and having that metal placed around your neck. It’s really something special. Be persistent. Be relentless. If people don’t want to hear from you, they’ll tell you. If they don’t, stay all over them. Especially if you have a story to tell, a connection, or can make yourself relatable. If you’re contacting them by email, there’s so much junk these days, they can easily overlook your message even if they’re more than willing to support. Or you can catch them at a bad time when they’re busy. Maybe they miss it 5 times and catch it on the 6th. Experiment with a different day of the week or time of the day to get in front of everyone you intend to. Make it personal. Draw a connection. And work as hard fundraising as you do training. I promise if you get a good response in the support department you will be that much more motivated with all those people in your corner! I run because I like to set goals, train for, and achieve them. I run because I like to stay in shape and live a healthy lifestyle. I run because it’s a time to escape and relax. But I run with a purpose. I run for a cause. I run for Team Boomer. I wear that name proud across my chest. I run to spread awareness. I run to raise support. I run for my best friend. I run… for Gunnar.